Chocolates, i cant give them up for any reason, if i feel down or happy immediately i'll bake something either with chocolate or else eat dark chocolate to keep myself comfort. Am starting an another week of blogging marthon with chocolates as theme. So the next three days is going to be desserts or bakes with chocolates. For today's post am posting a delicious,fudgy like cake with sweet potato and chocolate.Mashed potatoes are good replacement of eggs in cakes, obviously if am making eggless cakes i'll replace it either with applesauce or else with cooked mashed potatoes. But trust me, cooked mashed sweet potatoes are even more interesting to replace eggs in cakes. This simple chocolate cake came out extremely fudgy, i served this cake topped with a simply chocolate ganache, trust me this cake is seriously a fabulous feast to a chocoholic person like me.If you are planning to make a simple chocolate cake, give a try to this sweet potato chocolate cake. Preheat the oven to 350F, grease a round pan, keep aside. Combine the dry ingredients together, sieve twice and keep aside. Mix well the wet ingredients together in a bowl. Make a well in the centre of the dry ingtedients, gradually add in the wet ingredients, mix gently with a spatula. Pour this batter to a already prepared baking tray and bake for 25-30minutes. Allow to cool in a wire rack. You can top the cake with a simple ganache or else simply dust the cake with confectioner's sugar. gorgeous cake...looks simply amazing...bookmared the recipe . that is so interesting!!! must try.. chocolate cake with sweet potato!! so yummy!!! Assuming the sweet potatoes are pre - cooked????? Wow. the cake is simply superb. Got a new information about the eggs can be replaced with cooked potatoes. Have not tried yet. Sure will try some time. That's surely one stunning cake Priya..and the ingredient makes it even more special! The cake looks lovely. I didn't know that mashed potatoes could be used to substitute eggs in recipes and using sweet potatoes sounds even better. Pinned the recipe. have to try it out soon. Chance-e illa...you are very innovative..chocolate cake with sweet potato..I never imagined this combo!! Wow the cake looks very nice.Adding sweet potato gives nice taste. Never heard of adding sweet potato to the cake. You are a pioneer in these.looks so cool. Very interesting cake ! !looks super delicious! Thats a lovely looking cake & love the fact that you have used sweet potatoes in them. 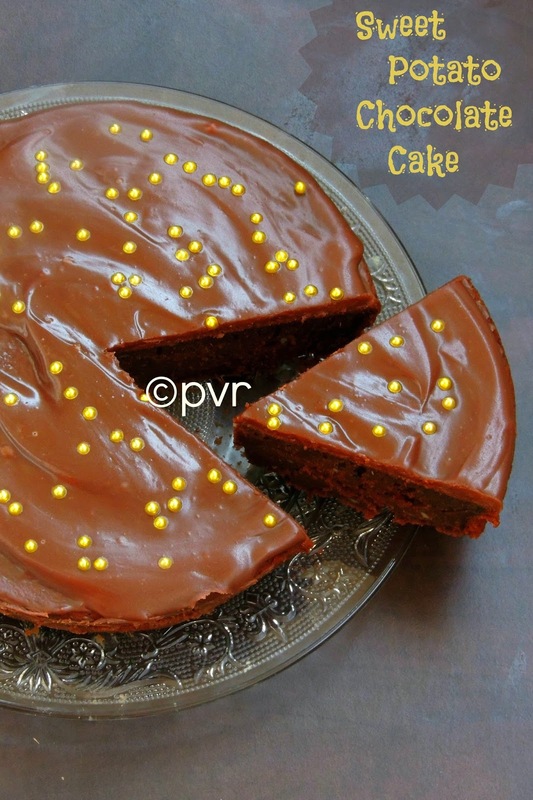 I have been thinking of experimenting veggies in cake recipes & this is a brilliant idea. Very interesting Priya. Never thought of adding sweet potato to the Cake. How about the taste priya.can't wait to try this...I will reduce the quantity and try. uff akka.... such a moist looking chocolate cake... want a pc now!!! Can I just have a slice, please ? :) The cake looks so moist and delish! Yummy cake...I'm just drooling for a slice.. Using sweet potato in a cake sounds yummy. interesting eggless cake Priya. With sweet potato. The cake looks very tempting.